So yesterday was my first time ever cooking lobster. I have to say handling live lobster was pretty daunting for me all these years to ever think of attempting to make a meal out of them at home. Once they arrived, I managed to enlist my gorgeous husband to be responsible for any live lobster handling situations (needless to say, with lobster on the cards for dinner, not too much convincing was needed!). The results were extremely tasty and worth the effort, and I have no doubts I will be cooking lobster again and again. For my first lobster dish, I decided to keep it simple and did a quick butter garlic sauce, and perked it up with some fresh coriander and lemon. It really does not take much time and effort to do this for dinner considering the wow factor. Definitely a good dish to have in your arsenal when trying to do something special without spending hours in the kitchen. A good thing to keep in mind with lobster is that bigger is not necessarily better. 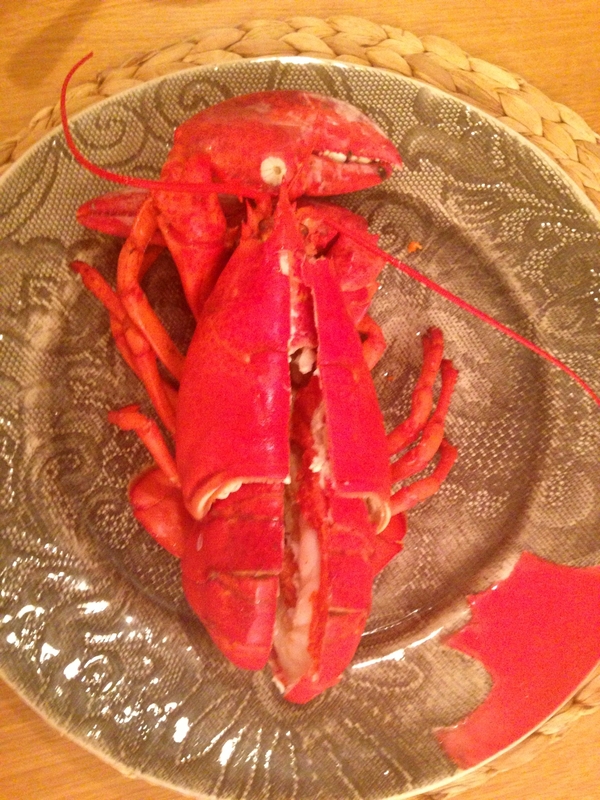 The meat of the smaller lobsters tends to be sweeter and tastier. I bought two 700 gram (1.5 lb) lobsters, the right size for one per person. I served it with a simple salad made with what whatever veg I could find in the fridge. Place your lobsters in the freezer for an hour so they become less active, easier to handle and some say feel less pain. Get the biggest pot you have and half fill with water. Add salt generously to water and bring to a boil. Once the water is boiling add your lobsters to the pot. Cover the pot with a lid and watch closely when the water starts to boil again. 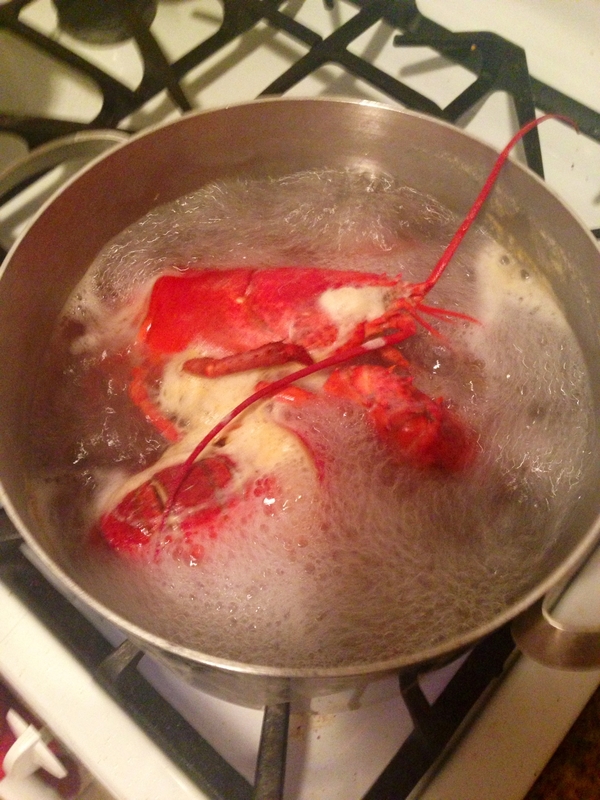 Begin timing for 15 minutes when the water boils (you may want to boil longer if the lobsters are larger). Once the time is up, take them out of the pot and place in a colander to cool a little. Once your lobsters are cool enough to handle, split them by taking a pointed knife and cutting on the cross mark behind the head. Cut all the way through till the end of the tail. Remove the green stuff and give a quick rinse in warm water. Now you can serve your lobsters in individual plates. Melt butter in a small saucepan, add finely chopped garlic and cook on med to low heat till garlic is softened a little, but no way near brown. Now add the lemon juice, finely chopped coriander leaves, pepper and salt to taste. Taste and adjust lemon and seasonings if needed. Cook on low heat and allow flavors to infuse for 2-3 minutes. Pour into a bowl.